I’m in the midst of the last few days of our Australian holiday, so this will be short and sweet, but I wanted to pop in quickly for the first Yarnalong of 2019. Knitting: My knitting’s been coming along with me everywhere this trip. I finished my Doocot sweater the first week, so have been working on Waiting for Rain and some vanilla socks out of Mondim sock yarn ever since. It’s been a long time since I’ve not had a sweater actively on the go, and while I’m looking forward to getting back to garment knitting when we return to the UK, I’ve got to say, it’s been fun watching smaller projects grow quickly! I’m well into the second skein of my shawl, and my socks’ feet are nearly done. I’ve had a new idea for a little sock design, and I’m wondering if I should try it out on the leg or keep them simple. Reading: I had high hopes for holiday reading, but most evenings I’ve nodded off before I can make much progress. But I’ve made a small start with James Herriot’s All Creatures Great and Small which I’m really enjoying. It’s funny and gentle and a perfect light read to see in the new year. 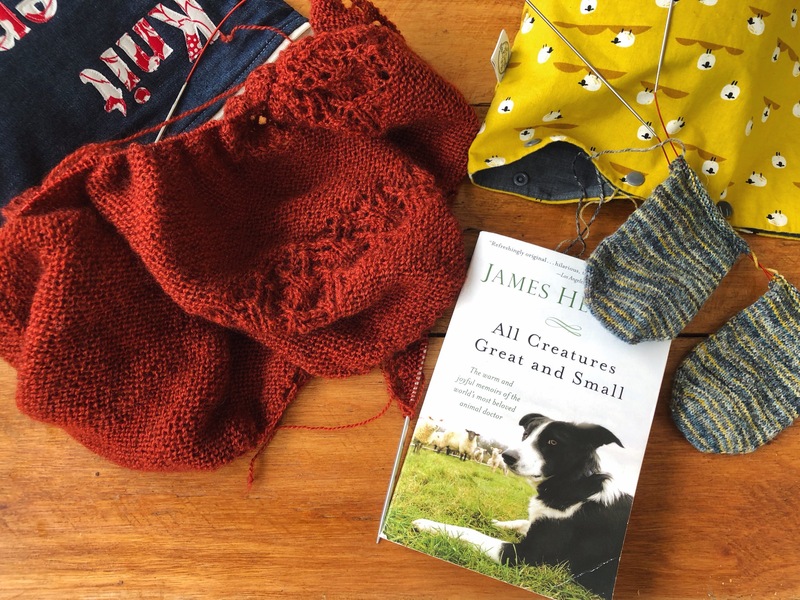 Head over to the original Yarnalong post to see what others are knitting and reading — what are you up to this week? Hope you’ve been having a happy and restful festive season. I don’t tend to do big year-end round up posts of what I’ve made (I like to save that for my blogiversary). But 2018 has been a big year, and I thought it’d be fun, as the new year dawns , to look back on some of the highlights of this year and make a few plans for the upcoming one! Knitting-wise, 2018 was a year of firsts. I massively enjoyed my first ever Edinburgh Yarn Festival, spending it with old and new friends. I taught my first knitting classes. I occasionally helped out at my favorite local yarn shop, Northern Yarn. I also got to work my first knitting festival at Yarndale on the NY stand and received the most special wedding blanket from lovely friends while there! And I released my first ever knitting pattern — something I never thought I’d do! Personally, it was a big year as well of course: settling into UK life, submitting my dissertation, and, most memorably, Mr. N and I tying the knot — and then celebrating throughout the rest of the year with our families and friends. I’m looking forward to seeing what 2019 holds and sharing more crafty adventures here. As ever, I’ve got a queue to knit that could see me through several years, but I’m also hoping to carve a bit of time out to learn to sew, do a bit more designing, and hopefully get into some more new fiber-y adventures! But for now, I thought I’d start 2019 with my “Make Nine.” Unlike last year, I’ve actually tried to pick just nine things, and I’ve included a few smaller projects in the hopes of making it achievable. And there’s a blank spot in the grid to represent the designs I want to work on! Middle: Houlland by Donna Smith; Còinneach by Kate Davies; Olivia by Julie Weisenberger. Bottom: Fjer by Fiber Tales and Tettegouche by Virginia Sattler-Reimer. It’ll all probably change, but I do love a bit of project planning! Do you already have any projects planned for the New Year? Hope you’ve had a happy and peaceful festive season, with a bit of time for knitting. Hi friends, and happy last first Thursday of the month for 2018! If you’re new around here, every first Thursday a group of us post about socks. Paula hosts a little link up over at Spin a Yarn so that people can join in any month that suits. I’ve not made much sock progress since last month, so I’ll quickly tell you what I’ve been up to and then talk a bit about handknit socks and fit, something I’ve been thinking about a lot.